When I disobeyed in ignorance thy fatherly glory, I wasted in iniquities the riches that thou gavest me. Wherefore, I cry to thee with the voice of the prodigal son, saying, I have sinned before thee, O compassionate Father, receive me repentant, and make me as one of thy hired servants. I have been entrusted with a verdant and faultless region, but I planted evil in its soil and reaped its cares with the scythe of laziness. And I gathered my deeds into sheaves but placed them not on the threshing-floor of repentance. Wherefore, I ask thee, O divine Husbandman, to winnow the straw of my deeds with the breeze of thy compassionate love; and fill my soul with the wheat of forgiveness. Store me in thy heavenly garners and save me. 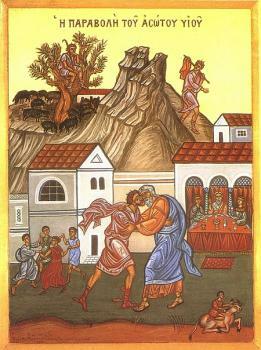 Read more about the Sunday of the Prodigal Son, in an excerpt from Great Lent by Alexander Schmemann.